2. Accident Benefits: If you are injured in an accident, this type of coverage protects you. You can be either at fault or not at fault. 3. Loss or Damage Coverage: This coverage protects you against a variety of losses such as but not limited to fire, vandalism, theft, etc. 4. Hit and run coverage: Protects you in case of an accident with a driver who left an accident site (also called hit-and-run) or uninsured motorist. Bundle: Do you need Motorcycle, Home and Auto Insurance? Many companies will offer you a discount if you bundle them together and buy them from the same company. Motorcycle Make and Model: Wisely choose your motorcycle, as some models are more susceptible to theft or even have a history of more risky drivers. Also repair costs would impact your premiums: more expensive models are often more expensive to repair. Age counts: Younger drivers bring in typically less experience and considered a higher risk for an insurance companies. That would be reflected in insurance costs. 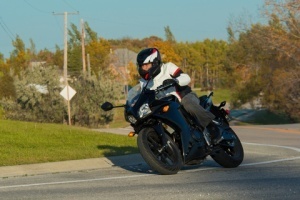 As you age, you can expect your motorcycle insurance costs to go down. Claims and driving history: Keeping your driving and claims record clean helps to reduce your insurance premiums – that must be quite clear to all riders. Storage matters: Similarly to car insurance storing your motorcycle in a secure garage will drive lower insurance premiums – motorcycle is consider to be an easier theft target than a car. Anti-theft system: Installing a certified anti-theft system on your bike results in a lower risk of theft and thus can often lead to insurance discounts.